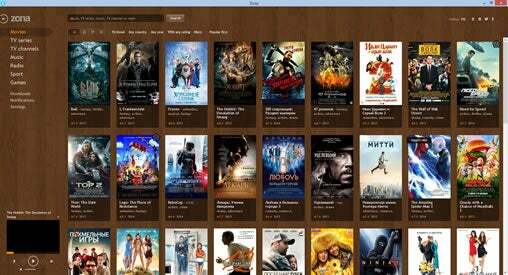 If Popcorn Time was “Hollywood’s worst nightmare” then the newest piracy app Zona could give Hollywood night terrors while being a pirate’s dream come true. If you are inclined to think peer-to-peer sharing is the devil, yet you currently stream Netflix, then maybe you should reconsider. TorrentFreak spotted a job posting which seems to indicate Netflix would like to integrate P2P technology into its streaming services. Unfortunately even if Netflix does head in that direction, that won’t stop the coming price increase. Hulu began blocking VPN users. While the point is allegedly to stop “VPN-pirates,” or people outside of the US from accessing Hulu videos, that type of IP blocking seems to ignore that some people use a VPN to protect their privacy and for better security. That brings us to a new app that won’t do anything to protect privacy, but will likely fill the gap for people who used a VPN to stream content. Popcorn Time was gorgeous, offering a nice Netflix-like user interface that made illegal activity like downloading movies very easy. Zona – a piracy app hailing from Russia – includes more details and many more choices. Let’s compare them; the top screenshot is Popcorn Time and the one below it is Zona. Besides offering 6,500 movies, Zona also has 5,000 TV series, 300 TV channels, 550 radio stations, music, sports broadcasts and online games. The 300 TV channels can be filtered by country as well as by quality. The Zona website claims there are 1,000,000,000 hours of music, but accessing it first requires logging in via vk.com and I passed on setting up an account to check it out. Here is where Zona blows Popcorn Time out of the water: After selecting a movie or TV series, another page appears showing about anything you might have wanted to know about the show. This includes the description, rating and other details you would normally see on IMDb, as well as related movies and TV series. The list of download sources shows quality, size, resolution and language. Here is an example for Game of Thrones. 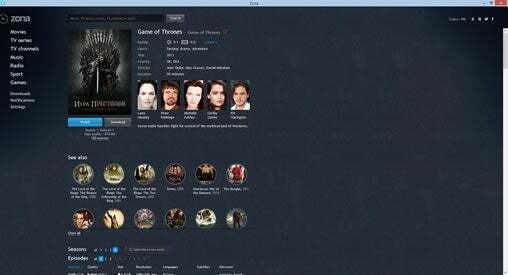 If you click on Peter Dinklage, then “more” movies featuring the Game of Thrones star appear. Whatever title you select, it starts streaming in a small box in the lower left corner, but it can be opened in another window and maximized to full screen. Here’s an example for a movie. The Hobbit: The Desolation of Smaug had 149 sources in English and Russian with subtitles also available. Under settings, the preferred language can be tweaked and even setup to hide movies and TV series not in English, or your preferred language. The video quality was excellent as you can see in the screen capture below. You can also change the theme as there are three options for the Zona UI appearance. Another cool offering is that Zona version 1.0.4.6 has an Android version, according to TorrentFreak, but I didn't try it out. That was the “good news,” but here is the bad and what I don’t like about it. I’m not a fan of Java and Zona is a closed-source Java application. Zona claims to have a “security guarantee,” followed by Norton, Kaspersky and AVG icons. Indeed, according to VirusTotal, those three don’t block Zona. ESET, Malwarebytes, Rising, Sophos and VBA32 disagree. Five out of 51 antivirus programs will flag the 27.7 MB Zona .exe installer as dangerous. Some marked Zona as related to adware. Malwarebytes Anti-Malware flags Zona as a PUP (potentially unwanted program), but if you still choose to move forward with the installation, then you can select “ignore” detections or “exclude” Zona from being detected as malware. I’d like to point out that Popcorn Time installation caused security software to issue similar red alerts. Web app hacking tools cause security software to freak out as well. Some antivirus solutions will even block “malicious websites” such as when trying to stream Game of Thrones off a link on Project Free TV. Temporarily disabling “malicious website protection” allows a person to stream; then “enable” protection and run a scan to make sure your PC didn’t pick up a disease. In the end, as a reviewed app, Zona is even slicker than the Netflix-looking Popcorn Time, offering more types of media and overall so many more choices…but it’s still a piracy app and therefore downloading copyright-protected content is illegal. Zona may blow up much bigger than Popcorn Time as TorrentFreak seems to suggest. If you too are lured to try this PUP, which is not usually an overly wise move, then use Zona with care cause Hollywood will have a cow. Zona can be downloaded from the Zone.ru site.